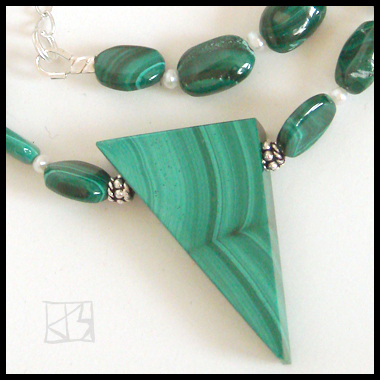 Malachite derives its name from the Hebrew Malakhi, al-Makit in Arabic, for king, as it has been collected for over 3000 years at the site of the biblical King Solomon's Mines. It was widely used by Egyptians who imported it from the Sinai. It is also found in such far-flung places as the Ural Mountains of Russia and the US-Mexico borderlands. Copper ore produces its treasured green striations. Something about this angular cut transfixes me; perhaps it's the dichotomy of the sinuous striations, or just the unusual cut itself. 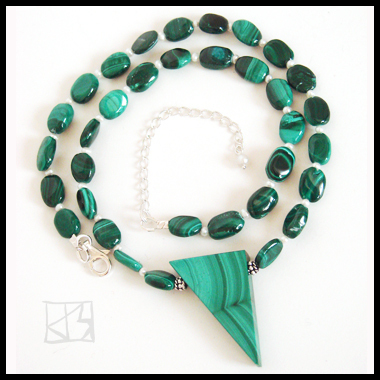 To accent this linear quality I've chosen to center it in soft oval beads of matching malachite, separated by tiny genuine pearls. A sterling silver lobster clasp with a 2.5-inch extender finishes this modern piece made of ancient stones. This copper-rich stone is said to absorb and emit energy -- wearing this beauty is sure to lift the spirits!